Up until today, all of the Photomatic photos I have written about are from the USA. 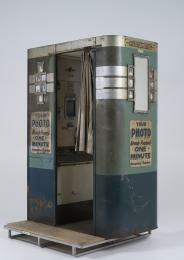 Photomatic booths were different to other photobooth machines, as they produced only one photograph, which was delivered to the sitter ready framed. Frames were made of cardboard and metal in various coloured finishes. Towards the end of their existence the frames were plastic. In Australia, the Powerhouse Museum in Sydney believes that only one photomatic machine was imported into Australia and it is possible that it was never put into service. Finding an Australian photomatic example is extremely remote, therefore finding any photomatic that is not American, was quite exciting for me. This picture of mother and son was taken in Scotland. 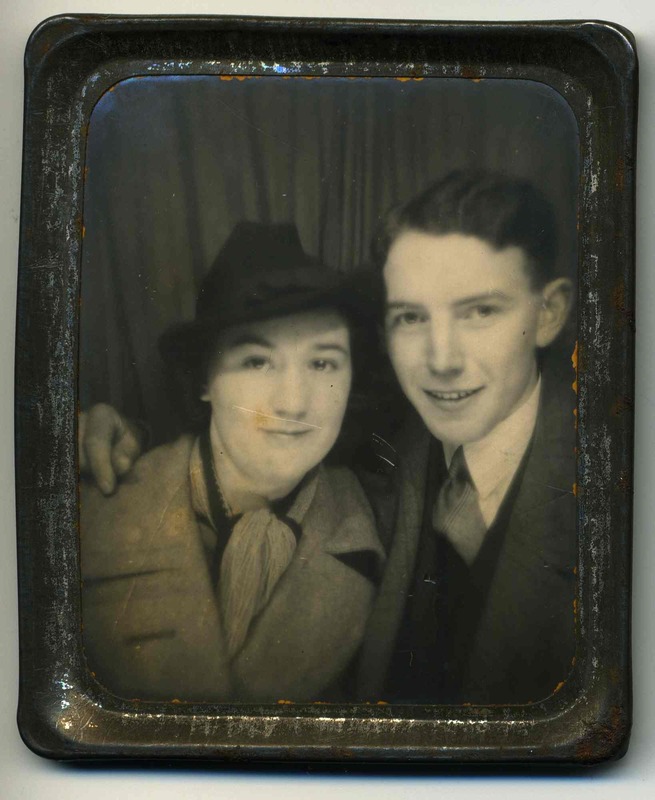 The Scottish seller theorised that it may have been taken at the Empire Exhibition, in Scotland in 1938. The event was an international exposition held at Bellahouston Park in Glasgow, from May to December 1938. It showcased the best of Scotland’s industry and creativity, while also offering a chance to boost the country’s economy, which was recovering from the depression of the 1930s. I find the atmosphere of this photo to be more restrained and demure than in most American images of the same period. The clothing is more conservative and the expressions of these two are more tentative and shy than the average North American sitter. It could be that these two are not typical of the British Isles. They are just two quiet people enjoying a day out. However to me it has a particularly British feel to it; friendly, homey and comfortably welcoming. I love the design of that photobooth! And I LOVE the typography on the signage… I want to a picture of it. I adore Scotland but puritanical isn’t how I see my Scots friends!! Hope the book is going well. How interesting, I didn’t realize Photobooths were so rare outside the U.S. Thanks for the info (and the sweet photo). Oh, I see the difference now. Thanks for the clarification. Love the photo of the old booth! What great colours, they do look like they are doing something terribly out of the ordinary…maybe a quick snog before the curtains opened..or spent their fish and chip money! Great find Katharine. What a wonderful collection you must have, how lovely to dream their stories. Sue. Hi Sue, yes, the design is brilliant isn’t it. Re Snogging, I hope not. I think it is a mother and son. Maybe not? What do you think? They’re the same age! Definitely a couple. They do seem a little nervous, though, as if they haven’t been together very long and just did something naughty. God, maybe you are right!? Just that terribly drab hat made me think it wasn’t a young woman. Her whole outfit screams “middle aged”. Fascinating images and background. The portrait is very much of its time & place. The metal frame suggests the daguerreotype frame, perhaps an intentional attempt to link it to aesthetic and emotional atmosphere of that medium. In American history & media culture, the daguerreotype represents a significant media milestone that American consumers would relate. Thanks for the link! I have three American daguerreotypes in my collection. Australian ones are much rarer and beyond my budget. They are so magical! I love them and tintypes equally. They have so much detail yet have an otherworldly look to them. They are like travelling back in time to see our Ancestors but using a crystal ball. Glad it was new to you!